The NEW FD-1040 Nesco Gardenmaster replaces the FD-1020 with a new digitally controlled top mounted fan design. The top mount fan prevents any dripping of what you�re dehydrating into the heater chamber. 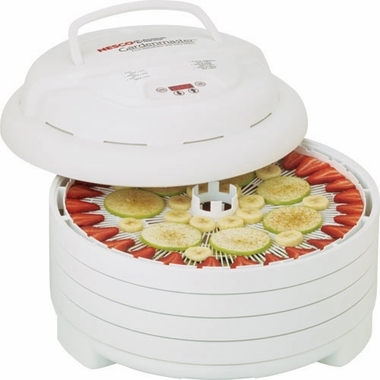 The FD-1040 Garden Master digital food dehydrator can be expanded to support up to 20 trays which is one of the largest capacities available for dehydrators. The heater operates at 1000 watts, in order to support the expansion ability, and it also dries faster. The fan in the Nesco Gardenmaster is run by a powerful 2400 RPM motor that moves the air quietly and efficiently. 1 Free fruit roll sheet - so you can make taffy, fruit leathers and crackers, or anything that starts as a puree or liquid. 1 Clean-A-Screen flexible screen - so you can dry your smaller items like herbs, spices and potpourri. Bought my dehydrator in Oct. 2014 and it is one of the best buys I have made. I have dried apples w/cinnamon & sugar for apple chips, and hamburger for beef jerky strips. Excellent. Can\'t wait to use it this summer and fall for other fruits and vegetables. My brother told me about this. His 1st one lasted 15 years and he just bought another one. I highly recommend this.